Most of Rome's tourist attractions are extremely well-covered by the many guidebooks to the city. But here are some of our special recommendations. They're not totally off the beaten track (in Rome, what could be? ), but they are less-frequented, less-publicised and well worth seeing. This attractive church is a few minutes walk from the Colosseum, up Via di San Giovanni in Laterano. The basilica is airy, with an attractive cloister. A gorgeous mosaic in the apse is rich and colourful, with charming animal details. But the best attraction lies underground. In the Basilica di San Clemente, three levels of history are preserved one above the other. Below the present church, which was begun in 1108 and reconstructed six centuries later, lies an older church. This is an extremely ancient place of worship, and was mentioned by St Jerome in 392. It was destroyed by the Normans, and the later church was built above it, but you can still walk around the earlier structure and admire some remarkable frescoes. These include a fine account of the life of St. Alexis - read the entertaining text provided. The deepest level consists of ancient Roman constructions, including a narrow alleyway and an assortment of small rooms including an early Christian meeting place. The most interesting section is the Mithraeum, with its characteristic stone benches and Mithraic altar, and a Mithraic 'schoolroom'. Tip: the small shop/ticket office sells a very good range of postcards, including details of the mosaic which make good gifts and Christmas cards. Entrance to the subterranean archeological site is €3. The immense remains of the baths of the Emperor Caracalla (Terme di Caracalla) are a little outside the usual central tourist circuits. Located a short walk from the Circus Maximus, the ruins stand in a peaceful spot where, despite adjacent roads, it is hard to imagine you are in the heart of a major city. Caracalla built a huge public baths complex, of which the standing walls are a powerful reminder of the sheer scale of ancient Rome. Sculptures found here are now on display in other musuems, but some black and white mosaics are still in place, and help the visitor to picture the original state of the baths. In the summer, the Teatro dell'Opera puts on shows here. The setting is incredibly atmospheric. For those in the know, this is a popular attraction. Locals bring their visitors here to admire the impressive optical effect created by Piranesi. It doesn't sound that wonderful; some trees and St. Peter's, but few leave uncharmed. Located in the artistic and enigmatic Piazza dei Cavalieri di Malta, a gate bars the entrance to the Priory of the Knights of Malta. Queue up to have a look through the ornate keyhole, and you'll see the Vatican's vast white cathedral floating at the end of a symmetrical tunnel of trimmed trees. The piazza is placed on the Aventine Hill (Aventino), which is a nice tranquil place to stroll on a sunny day. To reach the keyhole, you follow Via di Santa Sabina from the Circo Massimo (Circus Maximus) past a rose garden, two attractive churches and a couple of delightful panoramic parks. One, a walled garden filled with orange trees, hosts outdoors theatre in the summer months. 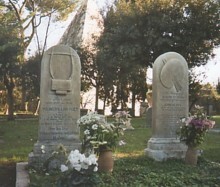 A short walk from the Aventine Hill is the Protestant Cemetery (Cimitero Acattolico), where non-Catholics are buried. The peaceful space next to the ancient Roman wall is crowded with tombstones and memorials. Placid cats wander along the narrow paths, and trees reach upwards to the sky. The most famous graves are those of poets John Keats and Percy Bysshe Shelley. Keats lies alongside his faithful friend Joseph Severn, in a grassy space overlooked by the gleaming white walls of the Pyramid of Gaius Cestius (Piramide di Caio Cestio). This Roman noble rather fancied the idea of the Egyptian pyramids, and thought it might be nice to have one of his own; he was buried here in 12BC. 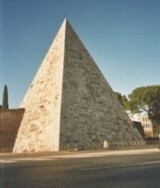 The Pyramid is only opened occasionally; but you can get a good view from the street and from the Protestant Cemetery. If the Grand Tourists and Rome's connections with English poetry interest you; the Keats-Shelley House is also well-worth a visit. Right next to the busy Spanish Steps, the museum is peaceful and charmingly old-fashioned; displays include relics of the two poets (Keats died in this building) and their contemporaries. Inn at the Roman Forum Unique boutique hotel with Roman ruins. Hotel Capo d'Africa **** A taste of luxury, close to the Colosseum. 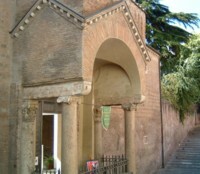 Residenza in Farnese **** Hotel with dream location in historic centre. Hotel Abitart **** Design hotel in Ostiense district. Relais Fontana di Trevi **** Comfortable rooms right by the Trevi Fountain. Hotel Raffaello *** A great 3-star in an area with character. Good breakfasts. Hotel Concordia *** Nice central 3-star near the Spanish Steps. Hotel Ascot ** One of the best cheap hotels in Rome. B&B San Jouan Clean and comfortable B&B not far from the Colosseum.